YMCA is the oldest and largest youth charity in the world. In England and Wales, the charity intensively supports 228,000 young people every year, ensuring each young person they meet has an opportunity to belong, contribute and thrive in society. Bluecube were initially approached to look at the internet connectivity across Lincolnshire YMCA’s network of sites. As the contract was eventually awarded to Bluecube to roll out connectivity, the organisations’ mobile phones were also reviewed and migrated to Bluecube management. As the charity were upgrading their IT systems and migrating the core infrastructure to a cloud-based solution, fast and reliable connectivity was of paramount importance. Bluecube were also asked to provide some cost analysis on their mobile fleet. A variety of internet services, ranging from a 300 Mbps Ethernet service to line-of-sight connectivity. Bluecube also provided a bespoke mobile upgrade to accommodate the tailored needs of the charity’s senior management team and other users. Increased bandwidth across the entire organisation and upgraded mobile hardware with reduced tariffs to provide a saving in monthly line rental. Crucially, the full management of the organisation’s communications infrastructure are now being managed by Bluecube’s local service desk team. A fast and reliable connection was required at The Showroom to support the charities IT and internet requirements. After deliberating on which solution would yield maximum efficiency, a 300MB Business Ethernet circuit was chosen as the optimum solution. Bluecube provided a connectivity report which compared the best speeds, carriers and pricing available. A Virgin line was chosen due to the competitive price and Bluecube fully managed a site survey. As part of the survey, Virgin engineers carried out inspections and confirmed the service was secure and available to install. The installation finished ahead of the 90-day installation lead time and the charity was fully active on their new internet service within around 60 days of ordering. Line-of-Sight is just one of the options in Bluecube’s extensive portfolio of internet services. The wireless service works by attaching a receiver dish to the side of the business property which then points at a wireless internet transmitter. The Line-of-Sight service also provides a much quicker installation time than a standard Business Ethernet service. Line-of-Sight is a very popular service with businesses in rural locations and area where broadband speeds simply aren’t fast enough. The service is also commercially viable for even small businesses without the budget for Business Ethernet. 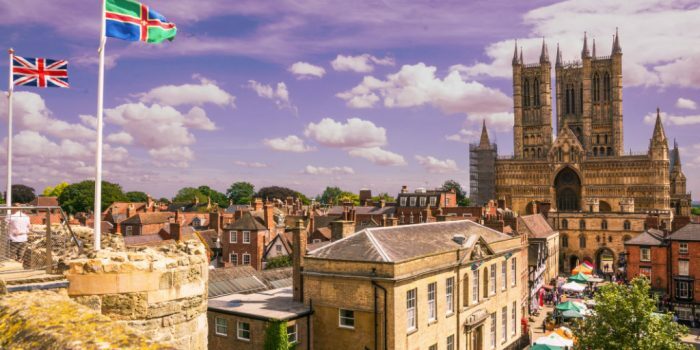 Bluecube also installed and connected several superfast fibre broadband services across various sites that are owned and managed by the Lincolnshire YMCA. The Director of Finance at YMCA Lincolnshire and asked Bluecube to provide a full mobile tariff review for their upcoming mobile renewal. Bluecube scouted the main UK networks to find the best pricing, tariff options and signal strength. YMCA was given a cost comparison report, which detailed Bluecube’s proposal against their current spend. A bespoke contract was chosen, with a mixture of SIM-only and single user tariffs. Apple iPhone handsets were provided and the number port, hardware dispatch and network connection were all fully managed by Bluecube’s support team. A Bluecube connectivity report gives a full analysis of any location and the carriers available at that business address. We can tell you the speeds, services and prices available across all major UK carriers and independent aggregators. A mobile review from Bluecube also analyses the tariffs and handsets available across all mobile operators before recommendation that fits your business requirements.